This posting looks at the Tarot Keys 3 -The Empress and Key 4- The Emperor as individual snapshots and as a union of polarity. The spreads provided drawn on the energies of each of the cards and the Union of Polarity spread coalesces the energies as a tool for inquiry. Enjoy! The Empress sits in calm repose. A beatific smile of promise and mystery gracing her countenance and all around her is the splendor and ripeness of the Earth. She is the expression of the High Priestess in the form of the Great Earth Mother. Where the High Priestess commands the Spiritual realms, the Empress is the Supreme Mother of the physical, earthly plane of manifestation. The Empress represents those instinctual and intellectual parts of self that are the Creatrix. Not in the manner of destruction and tearing away to rebuild, but with the quiet assurance that all she creates will be borne of great patience and guidance from a Higher Power, and governed by the stability and foundation of Earth. The tablet at her feet bears the symbol of the planet Venus and feminine energy. She is at once Virgin, Lover and Mother. And within her womb is contained the promise of creation formed by the merging of Divine Love and Divine Wisdom. Try the spread below, using The Empress as your anchor, to gain insight into any creative endeavor. 1. Thought – Higher Power – all creative endeavors begin as a seed of thought. This card will reveal the analytical nature required to achieve manifestation. 2. Intuitive Path – this is the filter through which ideas are tried and tested. What is your gut feeling? 3. Action Required -As thought descends closer to the physical plane of reality the active or birthing process must begin. What active effort must be provided? 4. Manifestation – what is the ultimate result of this creative process? 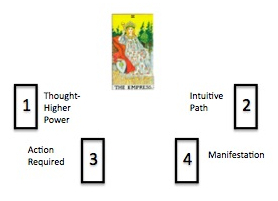 Note: In this spread the 4 active cards are the foundation upon which manifestation may be attained. 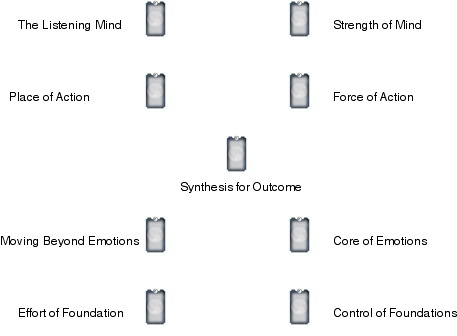 The number 4 resonates to organized structure, stability and cohesion. All of the sides in balance and in support of one another. 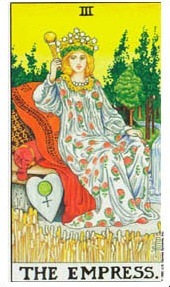 The addition of the Empress card creates a vibration of the number 5. Five is the number of change, catalyst, disruption of the status quo so that something new can be created. The Emperor sits upon his throne surrounded by the Ram’s heads of the astrological sign Aries. He is uncontested authority; representing leadership that needs no coercive means to affect his Will. His leadership is of the Higher Self and his guidance is that of Divinity. He is the Key 4 card of the Major Arcana and as such represents a foundation based upon equal balance and unwavering stability. Behind his complacent countenance beats the inner workings of clarity of thought, swiftness of action, deliberate aim and a true heart of justice. The Emperor is the more earthly representation of The Magician. His is the domain of manifest decisions and working the magick of harmonious balance-or discord- within physical realms. Just as the Empress is the Great Mother, the Emperor is the Great Father containing the strength of the Sun and the wisdom of the Sage. The layout of the cards suggests the necessary ingredients for creating a strong foundation that builds one upon the other. This spread can be compared to the Flash of Creation spread presented with the Empress (Feminine principle) above; but its focus is more strongly rooted in the stability of a Kingly authority. Try this spread when you are seeking guidance to begin a new project or new relationship that needs objective foundations. The Union of the Empress and the Emperor as they work hand and hand is the polarity and support of the attributes of Mother and Father. The creative flow of the Mother supports the structure of the Father to ensure that stagnation and inertia do not prevail. The strength of nurturing and dedication to progression and movement provides the foundation for authority to be exerted in a manner that is merciful and mindful of what has preceded and led up to this exact point in time. The Empress and the Emperor are the more human aspects of the High Priestess and the Magician. The former being held within the resonance of mundane and human qualities of experience and the latter being the expression or the Divine as it rises from the base of the human towards a more refined state that crossing into the realms of the otherworldly. The Empress and the Emperor are the call to achieving a place of balance. The energy between the combined uniting of the two polarities brings us to a place of the middle way of synthesis, harmony and equilibrium. The Empress – the number 3- the triune of force and form- the triple aspects of deity and the progeny of the union of two singular things joining ad producing the 3rd. 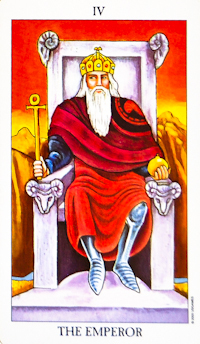 The Emperor – the number 4- stability- foundation- fertility and equilateral support. The union of the 3 and 4 produces the number 7- life’s lessons, paths of learning- thresholds to deeper understanding. Combined, they offer the potential for expanding or base of knowledge (4) towards creation of an energy that is both that of their combined efforts and the focused outpour of something newly birthed.